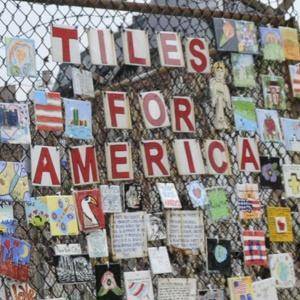 A September 11th tribute in the West Village corner of 7th Avenue and 11th Street, where St. Vincent's Hospital is located, featuring memorial tiles could be heading to a temporary home upstate.The parking lot's fencing supports Tiles for America, consisting of some 6,000 tiles created across the country. Currently owned by the NYC Metropolitan Transit Authority, Mulry Square is a triangular parking lot at the southwest corner of Greenwich Avenue was once thought to be the site of a wedge-shaped diner that was the inspiration for Edward Hopper's famous painting Nighthawks. Community Board 2 is recommending that the tiles be stored at the New York State Museum in Albany until a permanent location is found. Some community members wanted the memorial moved to 62 Greenwich Street while the Metropolitan Transportation Authority builds a ventilation plant where the the tiles currently hang. This will be incorporated into the exterior of a new MTA ventilation plant going up on the site, and the entire project should be completed in less than four years.